Some people always ask about the magic that Hard Rock had on the 80s. It’s simple to explain: on those days, the bands tried hard to write, at least, one song that could be a commercial success on the radios. Some bands embraced North American Glam Metal back them other preferred to stay on their musical roots. But when Grunge Rock and Alternative Rock crawled out from the sewers on the beginning of the 90s, everything was turned upside down, and it seemed that all happiness was a mistake. But thanks that those trends of the 90s disappeared, and Hard Rock, that was just being done and heard out of USA, came back. 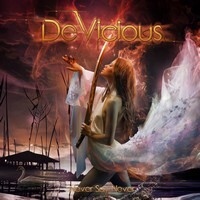 So to hear a band as DEVICIOUS (an international act based on Germany) is something really wonderful. Their album “Never Say Die” is amazing. If you’re searching for a new musical genre, forget this idea at once. This is the purest Melodic Hard Rock you can find, with deep roots on the same musical way that EUROPE used to play on “The Final Countdown” era, only with a more elegant insight and with accessible AOR touches. And yes, it’s excellent to hear such form of music. It’s fine, charming and strong, and what amazing energy flows from their songs. The album’s production was done by Alex Frey, the band’s bassist. And as all Hard Rock/AOR releases, it is truly clear, with everything on its due places, using tender instrumental tunes to improve the musical accessibility (and to reach a broader public, as a consequence of it). Obviously, all is working perfectly in this aspect, as a greasy machine. Musically, even not being musically original, they play an excellent set of songs. But the charming melodies and chorus of “Everything” and “Penthouse Floor” (both show very good vocals and keyboards parts), the elegant outfit of “One Track in Mind” (what a lovely work on bass guitar and drums), the accessible Pop touch that can be heard on “Crying in the Rain” (excellent guitars, indeed).